Our neighbors in the Three Lakes Council (Lakes Waccabuc, Rippowam, and Oscaleta) have an excellent website. One great article that caught my eye was the titled “Pet Waste – Get the Scoop on Poop” — all about dog (and cat) waste and the importance of picking up after pets. Here is a quick link to it. One highlight about cleaning up after your pets: “What you don’t pick up grows weeds or algae in our streams, lakes, and reservoirs. Pet waste contains nutrients that promote weed and algae growth. A 45 pound dog produces 2 pounds of phosphorus annually. Each pound of phosphorus contains nutrients for 500 to 1100 pounds of plants. These nutrients wash off roads and lawns and run downstream into our waterbodies.” and also “According to several national studies, about 40% of owners do not clean up after their pets. Most people recognize that dog and cat poop can be a nuisance and can affect water quality, but they think it is a minor contributor to the overall problem. The effects can be bigger than most people think. 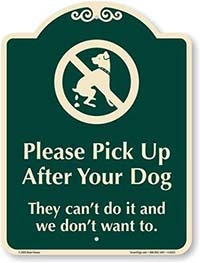 It’s also something that is in our control.” Please do your part when you walk your pets – thanks! More information about pets and the lake can be found here on our website.